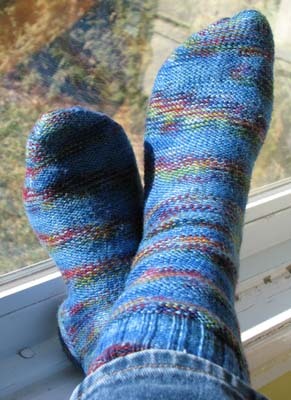 I don’t think I mentioned that I finished my first pair of socks! I got all distracted by … oops, not mentioning him. 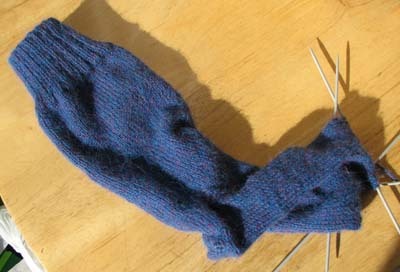 I immediately started on a second pair. And I’ve just bought yarn for two more pairs (I meant to only get yarn for one, to take with me to Vancouver, but couldn’t decide, and it isn’t like I’m not going to need more socks ever). I love the portableness of them. One set of needles, one or two balls of yarn, and a pattern already committed to memory. I used the pattern Yarn Harlot gave in her book Knitting Rules! : The Yarn Harlot’s Bag of Knitting Tricks. Only for the new pair I’m knitting, I increased the number of stitches at the start because I want to make a longer sock and so it needs to go farther up my fat calves. Then ribbed for longer so they’ll stay up. Then I decreased to taper into the ankle. Then I switched to purling for the sole of the foot so my sensitive feet won’t complain about walking on purled stitches. But other than that, it’s Yarn Harlot’s pattern. A couple of days ago, I made a lovely lentil rice soup for dinner, using smoked turkey. Everyone ate it and appeared to enjoy it. Yesterday, J wasn’t home for dinner and I had tons of the soup left over, so I decided we’d just have it again. Man, you’d have thought I had told the kids we were having week-old bread heels and puddle water for dinner from the amount of whining. Spoiled brats. The only one who didn’t complain was Boo, but she then ate about 5 fruit leathers while I was folding laundry and politely said no thank you to dinner, as she was full. I heated the soup, told the kids it was ready, and sat down and had a couple of bowls. The kids refused to eat it. Boo had stuffed herself on the fruit leathers, but she wasn’t whining, so I didn’t care. Asher ended up eating stale matzah with butter, an apple and a plain pita wrap. Maya had a bagel with melted cheese. I can’t decide if this makes me a good mother, or a bad one. I stuck to my guns and made the one dinner I said I would – nice, healthy, something they liked. So that is good. But when they didn’t eat it, I let them forage for themselves. I didn’t let them eat total crap and I didn’t make them anything else, so that fits in the good mom category, I think. But I wonder if I should have been tougher and told them it was soup or nothing. I see it this way…I wouldn’t want to be forced to eat something I really didn’t like or wasn’t in the mood for, and my kids’ feelings on the matter are not to be discounted just because they are kids. Frankly, being forced to eat what I didn’t like or want as a kid instilled some bad habits that took many years to break. I do the same as you did often. O. is picky (genuinely so, he does try things, he just doesn’t like many of them) and many nights has cereal, yogurt and crackers, or a veggie dog for dinner (the older two are allowed to microwave food but not use the range). That’s okay with me. I stick to my guns on only making one meal; if you want something else you’re on your own; it must be something you can prepare yourself and have at least some nutritional value (as subjectively decided by mom). At the very least, if you are a bad mom, I’m here to keep you company! When I make something one of the kids has a consistent dislike for, like Asher and beans, then I’m much cooler with them making something else. Like you, I have unpleasant memories of being forced to shove down stuff I hated, sitting at the table loooong after everyone else had gone because I wouldn’t eat those brussel sprouts. My problem with it this time was that they happily at the soup the day before, so they were just being ultra picky. They kept begging for take-out – “We haven’t had it in soooo long!” like it is some sort of weekly entitlement or something. But I’m glad you are here with me, in the bad mom pit. I think I would have done exactly what you did. Chez G, if Dad was home it was dinner at the table, meat starch and veg, everyone eats that or nothing. I used to soften this a bit by putting the food in serving dishes and letting the kids serve themselves. Rule was, take it = eat it, but you don’t have to take it. My offspring still tell horror stories about green curry and liver. If Dad was not home, chaos reigned and everyone got to forage in the frig. I like your sock colours. I will accommodate consistent pickiness (AM won’t eat potatoes, they make him throw up!) but not random we-just-don’t-feel-like-it-today pickiness. I only “force” them to eat something that I know they like but are just being lazy about eating, like raw carrots. If that makes any sense.